Celebrate mom with a free custard at Shake Shack this Mother’s Day. 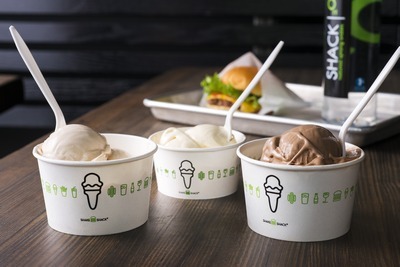 In celebration of moms this Mother’s Day, May 8, Shake Shack is giving any mom who comes into the restaurant a free cup of their famous custard. Moms can choose between three flavors of custard: vanilla, chocolate and their flavor of the week. Shake Shack’s Mother’s Day special will be available at both Valley locations on Sunday, May 8– Scottsdale Fashion Square (7014 E. Camelback Road, Space B116, Scottsdale, AZ 85251) and Uptown Plaza (100 E. Camelback Road Suite 100 Phoenix, AZ 85012) from 11am-10pm. Shake Shack sprouted from a hot dog cart in Madison Square Park in Manhattan to support the Madison Square Park Conservancy’s first art installation. The cart was quite the success, with Shack fans lined up daily for three summers. In 2004, a permanent kiosk opened in the park: Shake Shack was born. This modern day “roadside” burger stand serves up the most delicious burgers, hot dogs, frozen custard, shakes, beer, wine and more. An instant neighborhood fixture, Shake Shack welcomed people from all over the city, country and world who gathered together to enjoy fresh, simple, high-quality versions of the classics in a majestic setting. The rest, as they say, is burger history. ← Previous Previous post: 4 Recipes for a Stellar Star Wars Day!